The Forum for Expatriate Management- APAC Global Mobility Summit brings together global mobility professionals, industry experts and HR specialists. 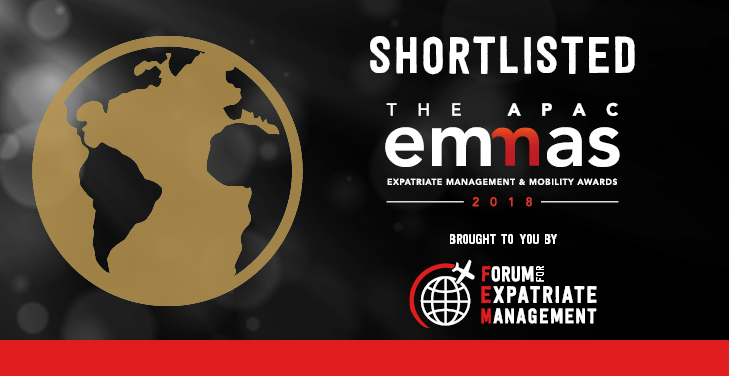 Taking place alongside the Summit, the EMMAs (Expatriate Management and Mobility Awards) celebrate success, best practice and innovation as well as the individual who has made an outstanding contribution to global mobility in the past 12 months. These awards celebrate success, best practice and outstanding contribution to global mobility. This year, on September 6, the EMMAs are taking place in Singapore and celebrate the best and brightest of the global mobility industry and supporting suppliers and vendors. For 2 years in a row, Convido Corporate Housing has been shortlisted in these prestigious awards as a Corporate Housing provider who has demonstrated excellence in corporate housing support for their clients and assignee population for both short and long- term accommodation. We are deeply honoured to be shortlisted for the EMMAs. This reflects our focus on high-level personalised service for our guests and clients, our premium quality apartments as well as our specialisation in the accommodation needs of the corporate sector. Our team are highly skilled, professional individuals who excel in their roles of Account Management and Guest Services. As such, we have been able to succeed in being an exceptional corporate housing provider, which is now once again reflected in being shortlisted for this award.